We’ve done the sweaty work, and compiled the definitive list of best children’s outdoor playgrounds in Singapore for you. You’re welcome! We’ll be the first to admit it – it’s tough not to simply hand over our iPads or mobile phones when our children get bored and start fussing. But if given the choice, we’d rather be actively engaging with our kids, and letting them get some physical activity in at the same time. Thankfully, Singapore has no shortage of outdoor playgrounds that you can explore with your little ones. We have playgrounds with gigantic slides, playgrounds with trampolines, and even playgrounds with flying foxes. All of them are 100 per cent FREE to access, so you’ve got no more excuses. Put on your comfiest footwear and rally the kids – it’s time to explore some of our favourite and most iconic outdoor playgrounds in Singapore! 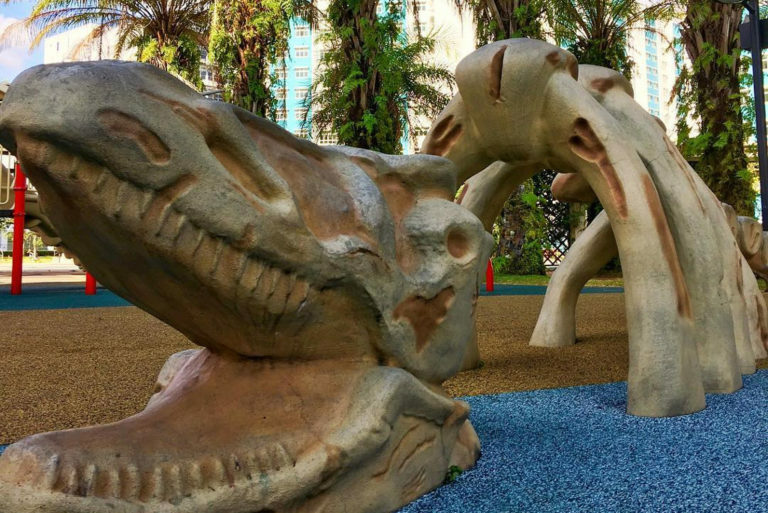 When we talk about old-school playgrounds in Singapore, the first playground that comes to mind is the iconic dragon playground located at Toa Payoh Lorong 6. Here’s the backstory: dragon playgrounds were conceptualised in 1979 by one of HDB’s in-house designers. They were inspired by dragon motifs commonly found in the local Chinese community. After 1993, dragon playgrounds were phased out due to safety concerns. Today, only three dragon playgrounds are left standing. The most famous one in Toa Payoh (which comes with a sandpit!) was thankfully left intact, although the blocks of flats around it were demolished. The other two dragon playgrounds are located at 240 Toa Payoh Lorong 1 and 571 Ang Mo Kio Avenue 3. Out of the lot, our favourite is the playground located near Block 61C Strathmore Avenue. It features colourful “telephone tubes” that your little ones can use to talk to each other. There’s also a gondola ride feature which is great fun for the kids – but be forewarned. You might find your arms aching after numerous requests for you to “ferry” your children back and forth! Located in the Singapore Botanic Gardens (SBG), this is the first garden in Asia dedicated to children. The garden first opened in 2007, but has recently been extended with a two hectare expansion. All in all, the Jacob Ballas Children’s Garden takes up an impressive four hectares, making it the largest children’s garden in Asia. Features include a sand pit, a water play area, a maze, a vegetable farm, a forest trampoline, a beat box station, a treehouse and a zipline. There are also various interactive and educational programmes available for children who wish to learn about nature. To find out more, check out the SBG website. Love hunting down retro playgrounds with your kids? 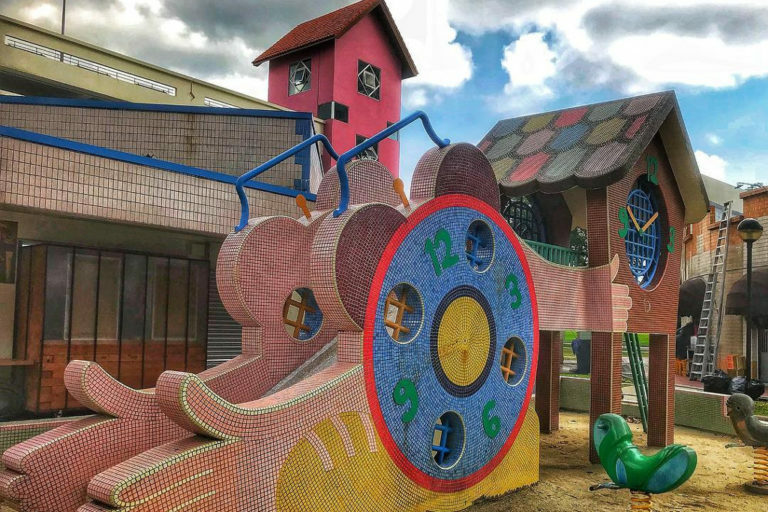 Here’s another one to add to your list – the clock playground that’s situated along Bishan Street 13, next to Bishan Interchange. 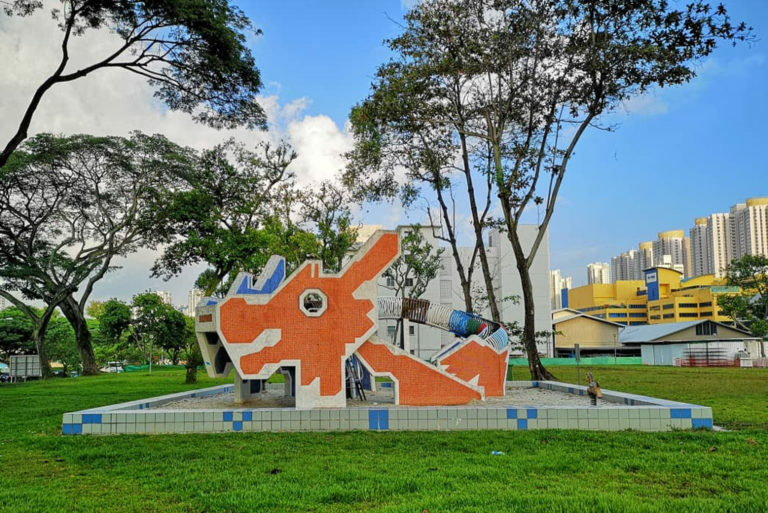 Like the dragon playgrounds in Toa Payoh and Ang Mo Kio, this outdoor playground was built in the 1980s – back when HDB was developing Bishan into a new town. The mosaic-covered clock playground might be small, but it’s got plenty of charm. You’ll find a cuckoo clock with a ladder, as well as a terrazzo slide that’s hidden behind a clock face. There are even quaint rocking horses sitting atop metal springs. If your kid loves fairy tales and all things make-believe, they’ll have a ball of a time at this playground. 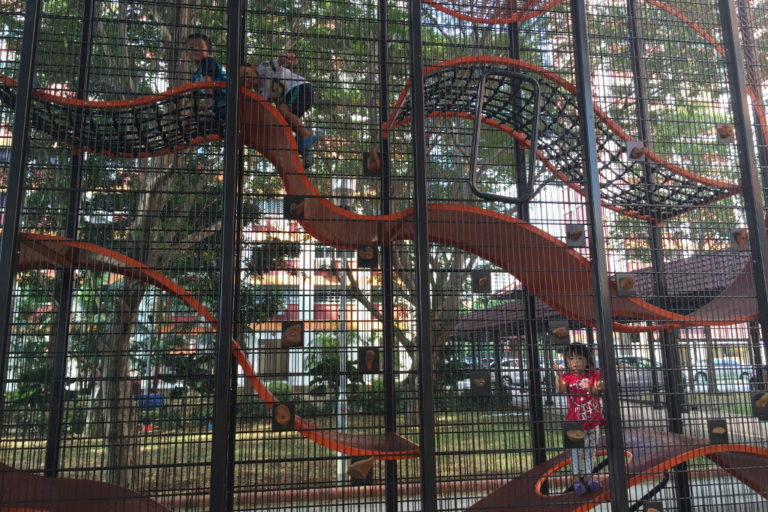 Just a short distance from the clock playground in Bishan is a vertical playground, also known as the Wallholla playground. Interestingly enough, this is the first ever vertical playground to be installed in Asia. It consists of a three-storey-tall structure that your kids can climb, crawl, jump on, or hang from. Once your kids have had their fill, they can slide down and move on to the secondary climbing structure (shaped like a barrel) nearby. If you’ve got hyperactive kids who can’t stand still, this outdoor playground will definitely tire them out! This one at Gardens by the Bay is one of our favourite outdoor playgrounds in Singapore. Where do we even begin? The Children’s Garden consists of four different sections: Adventure Trail, Rainforest Treehouses, Toddler Play Zone and Water Play. First up, the Adventure Trail is a 130-metre-long trail that features obstacles such as bridges, beams, slides, rope courses and monkey bars. Then there’s the Rainforest Treehouses, which your little types will love climbing. Once they’re at a certain height, they can slide down a pole to reach the ground, fireman-style! For those with younger kids aged one to five years, the Toddler Play Zone is your best bet. Similar to the Adventure Trail, you’ll find stepping stones and balance beams here, albeit smaller versions. Last but not least, the Water Play Zone is the highlight for most children. Make sure you bring swimsuits (and a change of clothes) for the kids, because they’ll definitely get soaking wet! 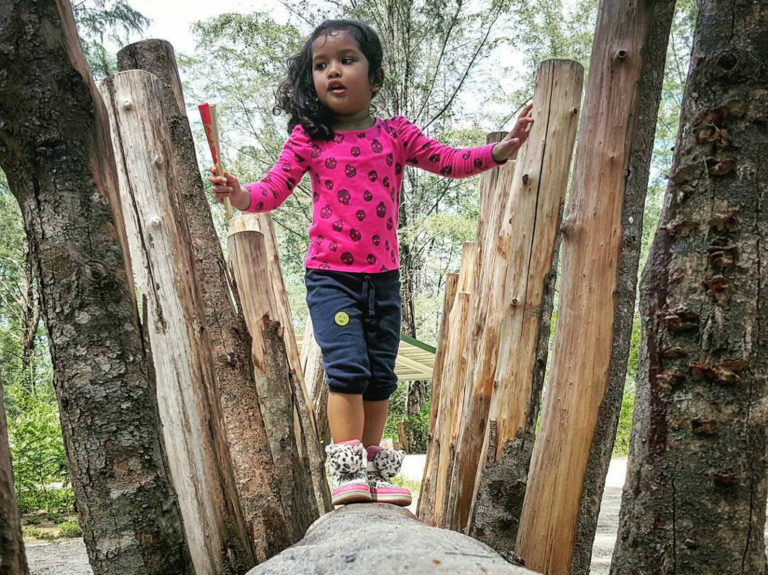 For a day of fun with the kids, make your way to Rumah Tinggi Eco-Park, which is right smack between the buildings in front of Leng Kee Road and the Rumah Tinggi hillside. Once the site of a KTM railway siding, it’s now home to a green corridor and children’s outdoor playground. Take a leisurely stroll through the bamboo grove and banana trees, then head over to the woodlands-themed playground that’s located near Kung Chong Road. The playground looks like it’s straight out of a storybook. There’s a kids-only tree-house which children may access by climbing up the planks fitted into the side of the tree trunk, tree-stump stepping stones, as well as a wobbly bridge and a hollowed-log slide. Keep your eyes peeled for the squirrel and raccoon which are peeking out from the tree! Those who speak Hokkien will know that Toa Payoh translates to “big swamp” in the dialect. True to its name, Toa Payoh used to be a large, swampy area back in the day. The outdoor playground at Toa Payoh Crest is a throwback to an era long gone. You’ll find raised mounds resembling stepping stones, as well as climbing ropes which lead your little ones to tunnel slides. They’ll have to get those creative juices flowing, but perhaps they can imagine that they’re traversing through swampy grounds! 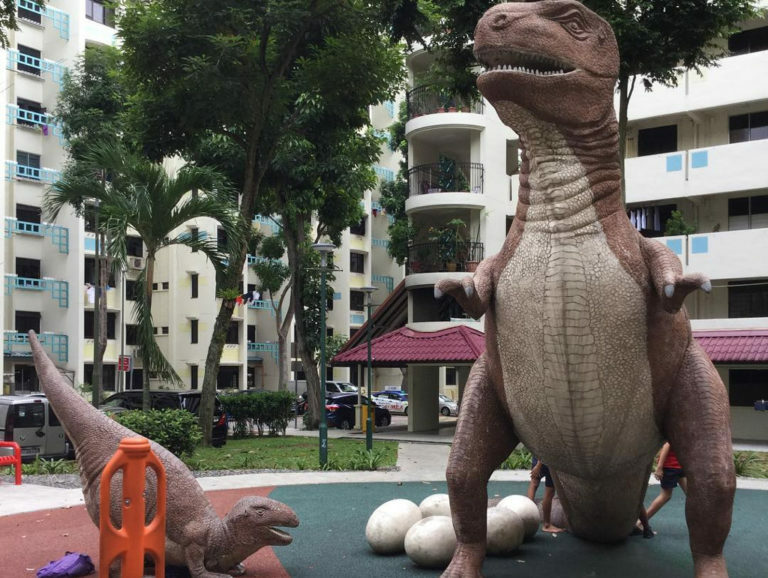 It’s not just kids who love the dinosaur playground at Kim Keat Avenue – parents seem to be oddly enamoured by it too. There’s no denying that this outdoor playground is adorably kitschy and one of a kind. So go ahead and indulge in your urge to gather up your kids and snap a selfie with the mama T-rex while you’re there! Beside the larger-than-life mama T-rex − she’s three metres tall! − lies five dinosaur eggs, as well as a smaller T-rex that your kids can climb on. There’s also a green bridge shaped like a Stegosaurus nearby. Admiralty Park spent a whopping two years under construction prior to reopening in October 2017. Today, it features a mind-boggling 27 hectares of greenery, nature and playgrounds, with a ton of superlatives under its belt. It’s the largest park in the North, and it also houses the largest nature area within an urban park. On top of that, there are 26 slides within Admiralty Park, another record-breaker in Singapore. It’s also home to Singapore’s widest slide and longest slide (in a public park). Areas you’ll want to check out include the Family Terracing Play area (challenging suspension bridges and climbing ropes), the Junior Play area (for gentler slopes and slides), and the Adventure Play area (which comes with adventure roller slides). 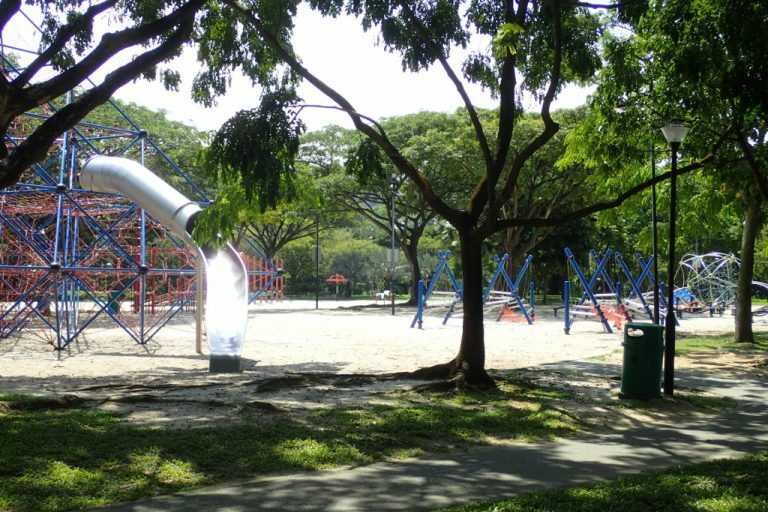 Regardless of whether your child is three or 12, they’ll have a ball of a time at the playground at Admiralty Park. Back in the day, Marsiling Park used to be known as Woodlands Town Garden, or the garden near the Causeway checkpoint. The garden featured a viewing tower, Chinese pavilions and stone bridge, but not much more. After undergoing a 22-month makeover recently, it now includes three spanking new outdoor playgrounds that your kids will love. First, there’s an intriguing butterfly-shaped playground complete with climbing ropes. This playground references the fact that there are numerous butterfly species within the park, and the playground comes with several educational boards where your children can read up about them. Next, a Fun Play area which consists of play equipment with musical elements. Last but not least, check out the ninja warrior-style playground complete with rope structures as well. The outdoor playground at Woodlands Glen was constructed only a year ago, but it’s quickly become a hot favourite with residents living in the area. Again, this is one of HDB’s new thematic playgrounds which pays homage to the history of the neighbourhood. The story goes that Woodlands used to be rich in biodiversity, and home to many common insects. 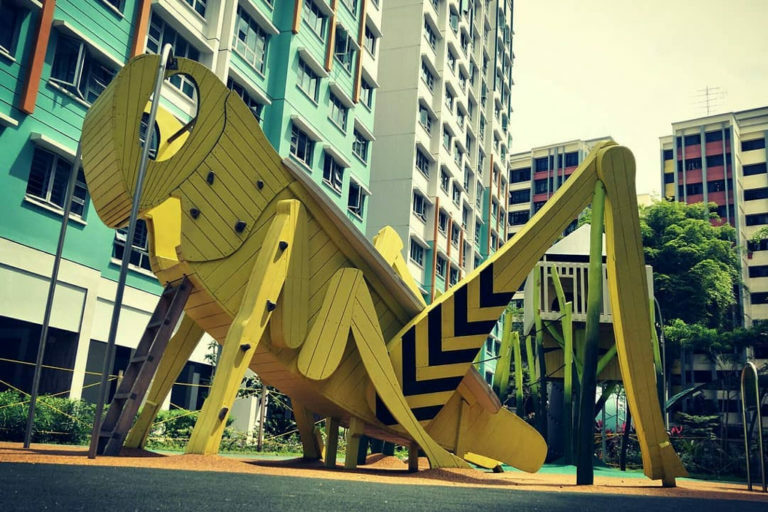 Apart from the giant grasshopper which kids can clamber up and slide down, the playground also consists of a series of climbing poles that are cleverly designed to look like blades of grass, a giant ant with climbing holds and a slide, and finally, a tree house complete with viewing deck. Canberra Park consists of three different play areas, the first of which houses six different types of swings. There are your run-of-the-mill swings, of course, but the more adventurous kids will skip past these and head straight for the standing swings, which are challenging to remain on without falling over. Children with disabilities will also be able to join in the fun, as there are inclusive swings which are wider and feature an additional lap bar for safety. Besides this, there’s another play area that consists of several ramps and walkway, complete with a dinosaur fossil play structure. There’s also an extensive rope obstacle course featuring net bridges, rope handholds, step plank bridges and cargo nets. This course will keep your little tykes busy for quite some time! 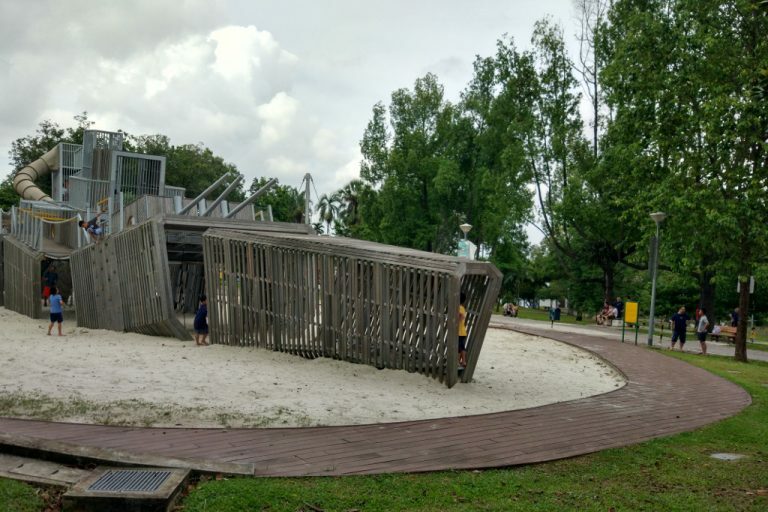 Sembawang might be pretty out of the way for those who aren’t staying in the North, but it’s here where you can find a hidden gem of an outdoor playground that’s designed to look like a shipwreck. Why the nautical theme? Well, Sembawang used to be a naval base that housed plenty of bustling shipyards, and this playground plays homage to that. The life-sized shipwreck was built in memory of British battleships that sank after being attacked by the Japanese during World War II. The shipwreck, which is made out of wooden planks and galvanized steel, is outfitted with a gun turret, smokestacks, propellers and even a rudder. To board the ship, kids have to make their way up to “rigging” and navigate through the decks. They then exit through one of the escape hatches or slides, and head over to the climbing net and pendulum swing. 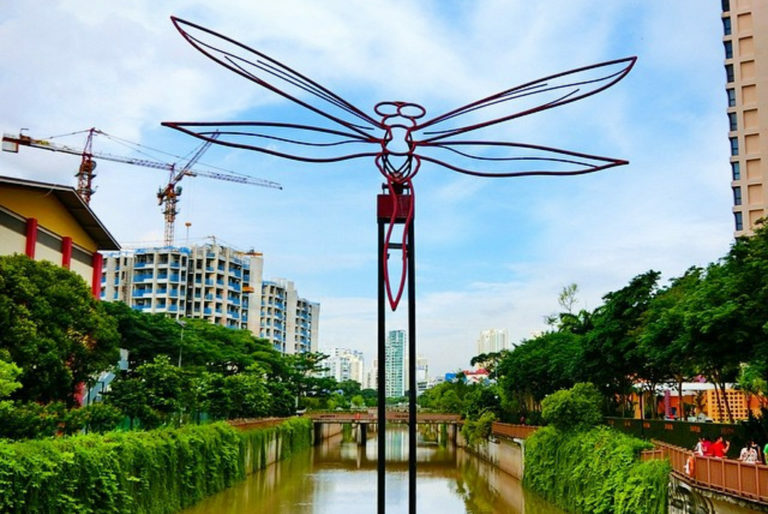 While you’re in Sembawang, also stop by Montreal Green Playground. Located at the junction of Sembawang Road and Canberra Link, it’s divided into two areas. There’s a less challenging play area complete with a seesaw and a mini merry-go-round for the younger kids. The older ones can explore the taller slide and mini rock climbing section. Playground aside, Montreal Green also offers water features and a suspended rope bridge that your children can use to navigate their way across a kid-sized canal. Within the idyllic hipster enclave The Oval @ Seletar Aerospace Park, you’ll find an aeroplane-themed playground. The section designed for older kids aged five to 12 years is dominated by the plane. 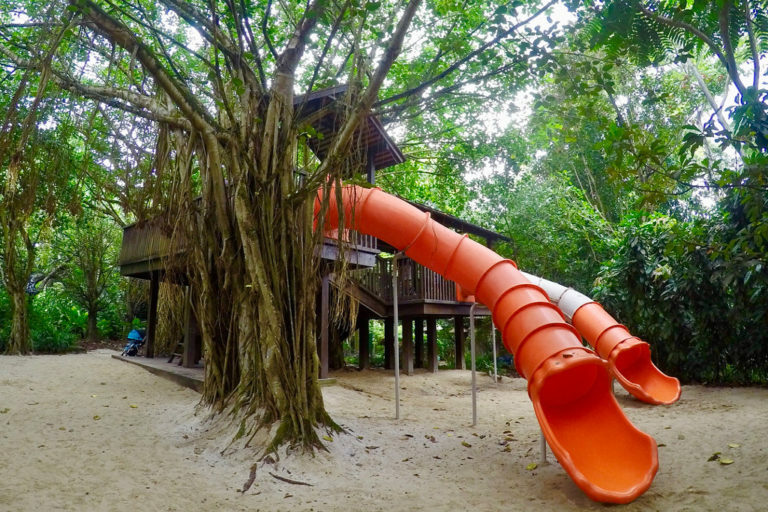 It boasts two slides you access via a tunnel, a climbing slope and monkey bars. There’s also a huge bowl swing where three or four kids can lie back and chill. Next to it is a ‘control tower’ climbing structure with a cylindrical rope ladder and curving slide. The playground for two- to five-year-olds has its own mini plane structure that little ones can climb into more easily. There are also two little rockers, a round helipad, a two-seater aeroplane and toddler swings. The whole family can also have fun playing a life-size game of Aeroplane Chess, or Ludo, as we used to call it. 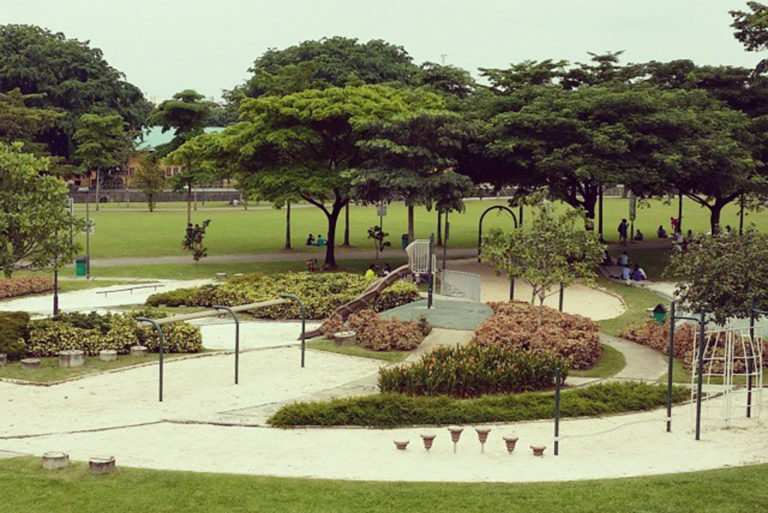 The outdoor playground at Yishun River Green is one of the kookiest we’ve come across. Its centrepiece is a rope structure that’s reminiscent of a spiderweb. 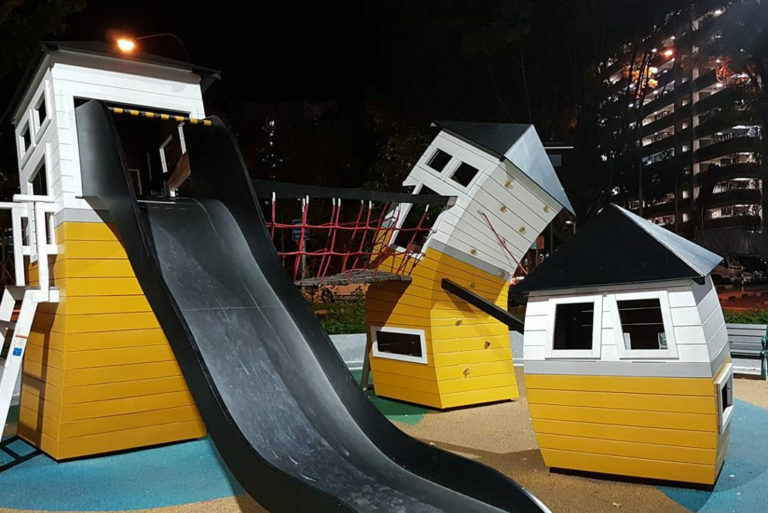 The playground also features several crooked houses designed by MONSTRUM. For the uninitiated, this is a Danish company renowned for reinventing kids’ playgrounds. These crooked houses were handmade out of top quality weather-proof wood in their Copenhagen workshop. Last but not least, there’s the Mini Pool, a kid-friendly art installation that consists of 16 pads on the ground. These pads light up and change colour when they’re stepped on. They’re the brainchild of interactive light sculptor Jen Lewin, whose works you might have seen in iLight Marina Bay 2014 and 2016. Psst! The light pads are only switched on in the evening, so don’t leave too early! 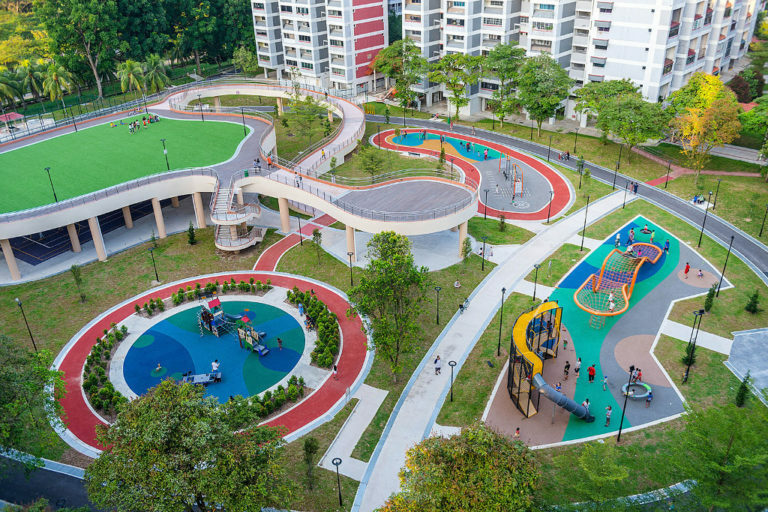 Bishan-Ang Mo Kio Park has a total of three outdoor playgrounds – the Water Playground, Adventure Playground, and Inclusive Playground. To encourage your kids to learn about gravity hands-on, head over to the Water Playground. They’ll be able to manipulate a series of metal gates to control the flow of water. Do note that the water is only turned on from Thursdays to Sundays from 8am to 11am and 4pm to 8pm. 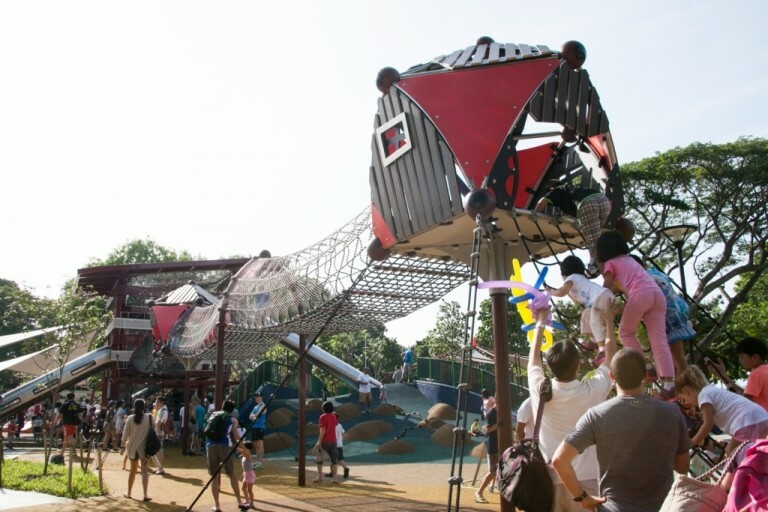 Next, move on to the Adventure Playground, which features a wooden fort with slides, a four-tier structure complete with wooden ramps and climbing ropes, and a climbing pyramid. Last but not least, the Inclusive Playground has swings, merry-go-rounds and other play elements that accommodate wheelchairs. 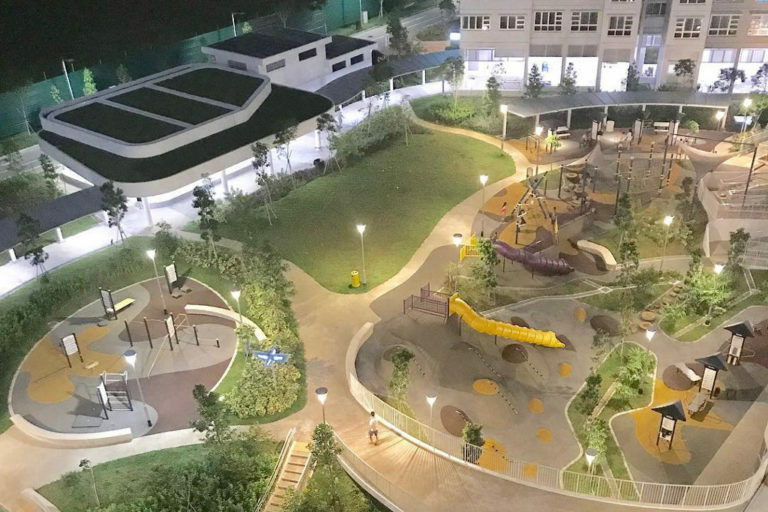 One of the newest and swankiest outdoor playgrounds on this list is Jurong Spring Playfields, which opened earlier in 2018. In fact, it isn’t entirely accurate to call this place a playground. It’s actually a large compound housing several playgrounds and fitness corners. It even comes with a basketball court! There’s plenty of fun to be had, with a key attraction being the vertical playground that’s outfitted with a fun tube slide. Right next to the vertical playground, there’s a giant rope structure, as well as a trampoline. To cater to the younger kids, there’s another smaller, less daunting playground. There’s plenty to keep the adults occupied as well. Head to the fitness corner and make good use of the weights and resistance bands, or come on Friday evenings to join in a free High Intensity Interval Training (HIIT) workout. West Coast Park Playground has been around for ages now – it opened back in 1999 – but it’s still immensely popular. With six different areas which cater to kids of varying ages and skill sets, it’s a one-stop shop of sorts. First up, there’s a larger-than-life rope pyramid which stands at 9.3 metres tall. Trust us – your kids will insist on clambering to the top once they set their eyes on it. Feel free to jump in should the pyramid prove a little too challenging for them to navigate on their own. Nearby there’s also a bridge with metal rungs, a balancing beam, and a climbing sphere. Make your way to the next section, and you’ll find four mini zipline stations, as well as a wobbly bridge, a merry-go-round, a disc swing, and an obstacle course. Don’t forget the Viking ship playground, which is a huge hit because it’s enclosed in a sand pit. Finally, there’s a toddler play area for children as young as two, a wooden obstacle course, and an inclusive playground. Not everyone knows this, but Keat Hong estate used to be home to several military camps. 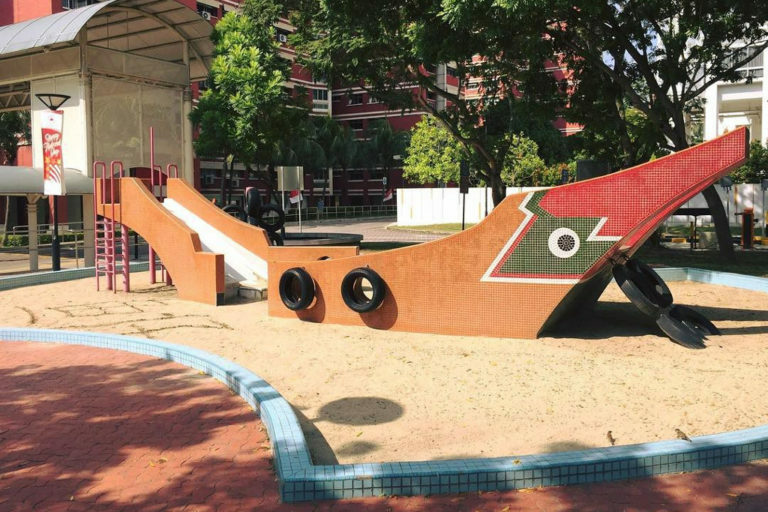 Paying homage to the estate’s history, HDB built two military-themed outdoor playgrounds there a few years back. These are located within walking distance of each other, so prepare for a few hours of fun! 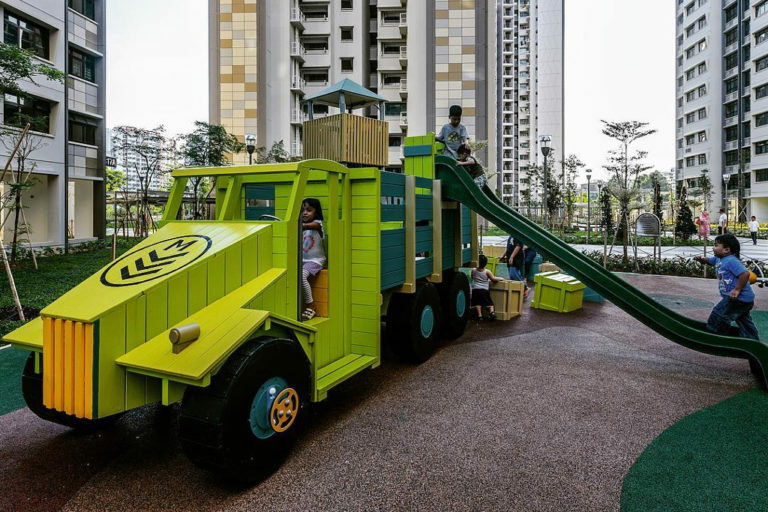 The first playground at Keat Hong Garden features a mini obstacle course, as well as a huge military tank complete with climbing mat. There’s also a vertical playground and a play area for younger children. In keeping with the theme, the entire playground is outfitted with camo-coloured flooring. The devil is indeed in the details! 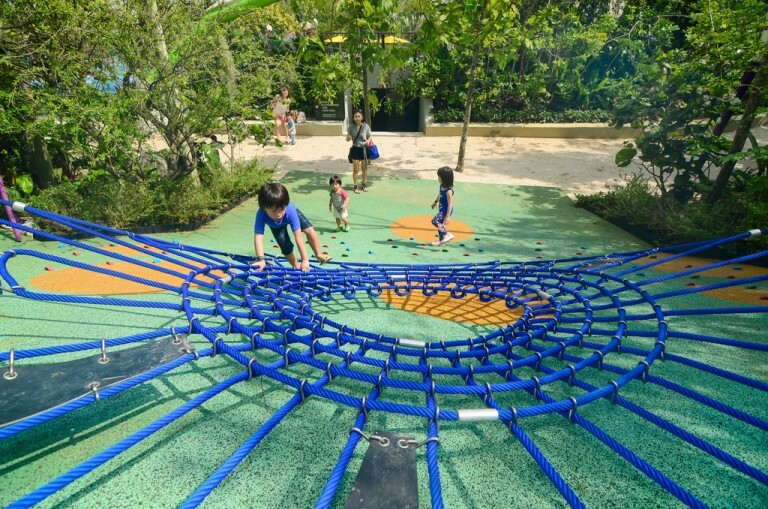 Once your kids have had their fill of fun at the Keat Hong Garden playground, head over to Keat Hong Mirage, just five minutes away. The focal point of this outdoor playground is definitely the bright green army truck. Like the crooked houses at Yishun River Green, this truck was designed by MONSTRUM, and handmade at their workshop in Copenhagen. Once they’re on the truck, kids can either remain in the driver’s seat, or make their way to the back where they can slide back down to the ground. The area behind the truck is decorated with fallen crates, and there’s also a watch tower that features a fireman pole. Jurong Central Park lays claim to being the first park in Singapore to have life-size board games. The pavement on the ground is marked with numbers, and you can either look at the dice tower located in the park or download an app on your phone to generate a number for your next move. If you land on a ladder, you’ll have to climb across an obstacle, and make your way to the higher number. If you land on a snake, then it’s down the slide you go. Snakes and Ladders aside, there’s a life-size Ludo game board here as well. Just like at Seletar Aerospace Park, players act as Ludo pieces. With a ‘throw’ of the dice, they move around the board with the goal of returning to their base. 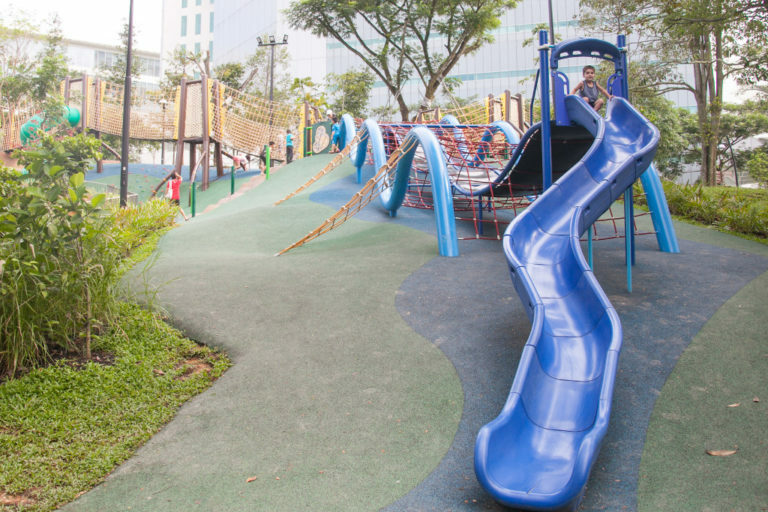 The playground at Jurong East Street 21 is located conveniently next to the outdoor ball court at Yuhua Community Club. If your kid is tired of generic playgrounds with swings and slides, perhaps this unorthodox playground will tickle their fancy. First, there’s a 12-sided rock-climbing structure which is more difficult to scale than you’d imagine. Once your child has conquered that, they can move on to bouncing on the trampoline that’s embedded in the ground. Younger ones can enjoy the two toddler slides and a large net obstacle structure. 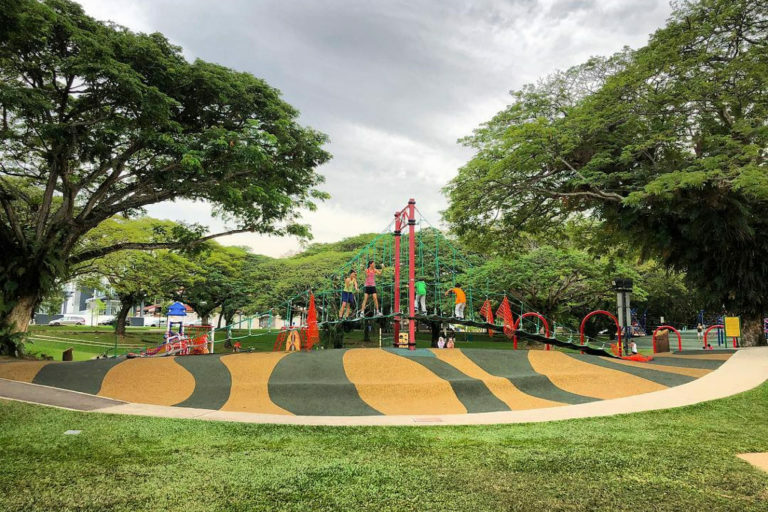 The recreational enclave at East Coast Park underwent a $18-million revamp two years back, and it now features a 3,500 sqm playground that caters to kids of all ages. The first thing you’ll spot is an eight-metre, three-storey tower, which consists of three slides with varying challenge levels, a rope bridge and several climbing net courses. Parents of young ones will be glad to know that the rope bridge connected to the tower is sturdy enough for adults to clamber on as well. What makes the Marine Cove playground special is the plenty of play facilities and equipment suited for children with special needs. The swing set, for example, includes an accessible swing seat that is equipped with an extra safety harness. There’s also an interactive game station installed at waist level to provide easy access to children in wheelchairs. 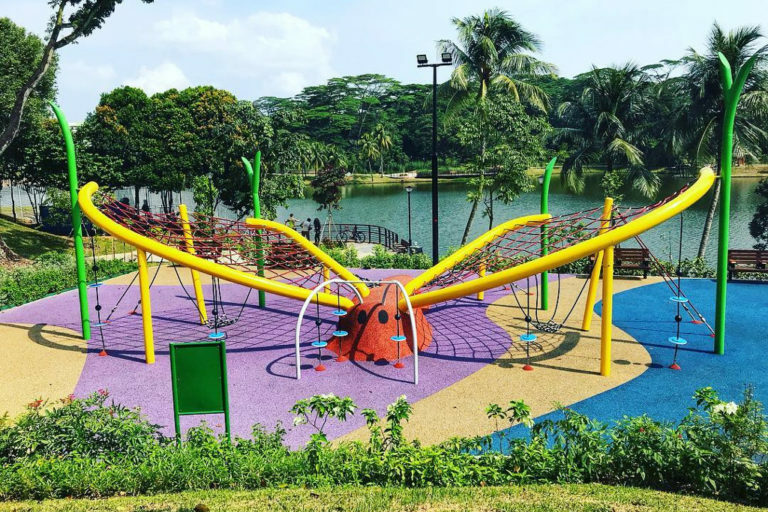 Pasir Ris Park playground, located near Elias Road, surely has it all. Play elements run the gamut from swings with bucket seats to miniature mazes and tunnels. There are also rock-climbing walls, suspension bridges, sandpits, rotating bars, and a flying fox structure. The most popular of the lot is a 10-metre-long slide that connects to a rope pyramid perched atop a hill. This outdoor playground is well-shaded by the trees in the area, so you don’t need to worry about your kids getting sunburnt. Decided to swing by on impulse and don’t have your kids’ bottles on hand? Simply head to the water coolers or vending machines near the swings with bucket seats. 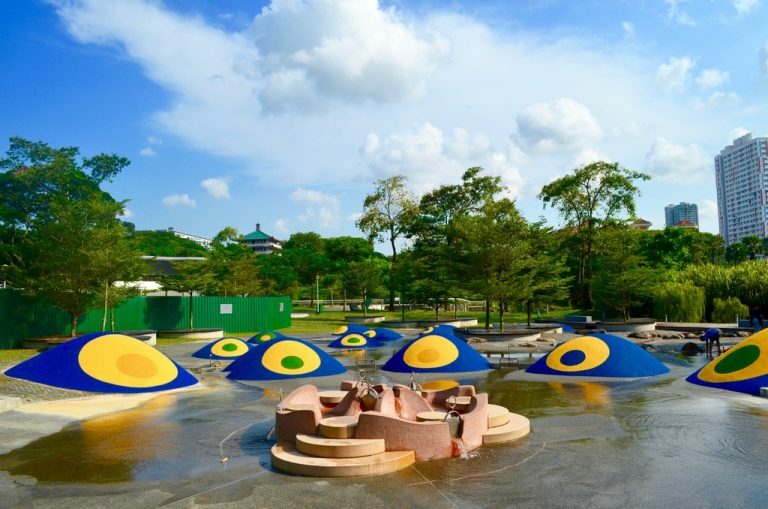 This sampan-shaped outdoor playground, which was built in the 1980s, is located in a sandpit next to Elias Mall. We hear that it was designed to look like the bumboats which ferried cargo from larger ships to the shore. Want to take a trip down memory lane? A trip to the Pasir Ris bumboat playground is in order! The bumboat structure at the playground is split into two halves, one of which contains a tyre ladder. The other features a terrazzo slide. There is also a climbing structure, made out of tyres, that can be accessed separately. Fun fact: the eyes at the bow of the bumboat reference the fact that boat owners traditionally paint eyes on their boats. The eyes are said to be able to protect the occupants of the boat from danger. There’s much to do at Coney Island – you can explore the beaches, go cycling, or even engage in a spot of bird-watching. 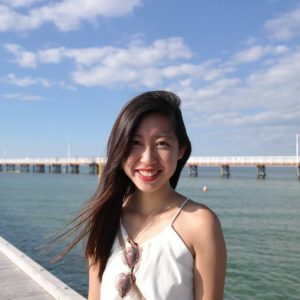 Of course, you’ll also want to head over to Casuarina Exploratory. This is an all-natural and environmentally friendly play space. This outdoor playground is decked out using fallen casuarina trees and other natural materials. There may not be any brightly painted structures, but that won’t stop your kids from having fun. Time your kiddos as they race to complete the obstacle course, and encourage them to try and beat their own records! Are you and your kids are fans of Captain Jack Sparrow in the movie series Pirates of the Caribbean? Then this pirate-themed outdoor playground is sure to be a huge hit. Among other things, the playground consists of a spiral slide, as well as cannons that children can manipulate to produce booming noises. There’s also a treasure hunt game that’s plenty of fun, and a plank that your young Captain Jack can use to sentence his mateys to their doom. 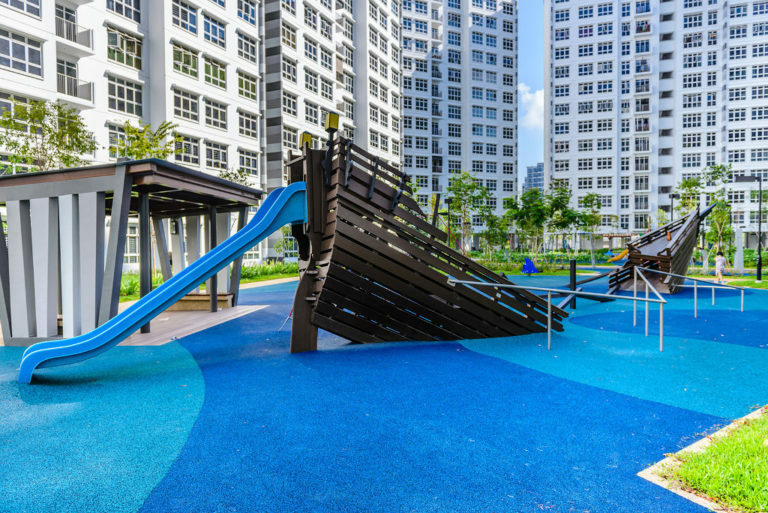 If you ask us, the shipwreck playground over at Compassvale Cape is one of the most innovative outdoor playgrounds in Singapore, hands down. 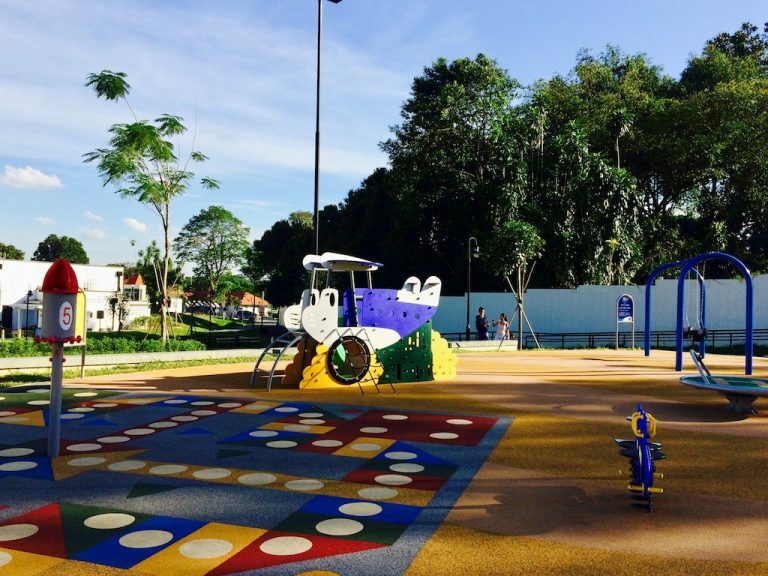 This thematic playground reminds us that Sengkang was a fishing village back in the day. In fact, when HDB starting building flats here, our local papers started calling the estate “Town of the Seafarer”. In this playground, you’ll find a sunken ship that comes with a broken mast, climbing ropes and balance beams. Kids can take cover inside the hull of the ship, or clamber to the top using the rock-climbing holds. For younger kids, there’s a smaller, more manageable boat structure, as well as a shark-shaped rocking chair and a octopus-shape see-saw. 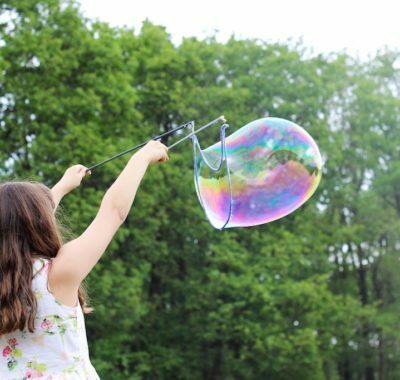 Bookmark this bumper list of free kids’ outdoor playgrounds, and you’re pretty much set for the rest of the year and beyond. Just remember to slather sunblock on your kids, bring plenty of water, and you’re good to go. Here’s to spending quality time with your little ones!